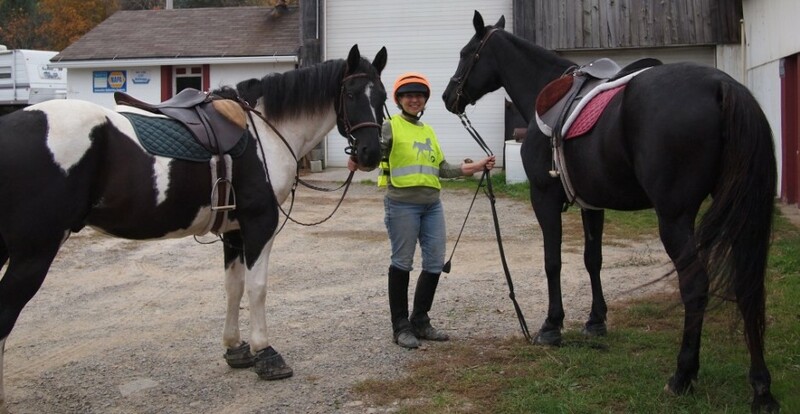 ← Memorial Trail Ride for Kenneth W. Bellis, Jr. It was dark, cold and anything but lonely. 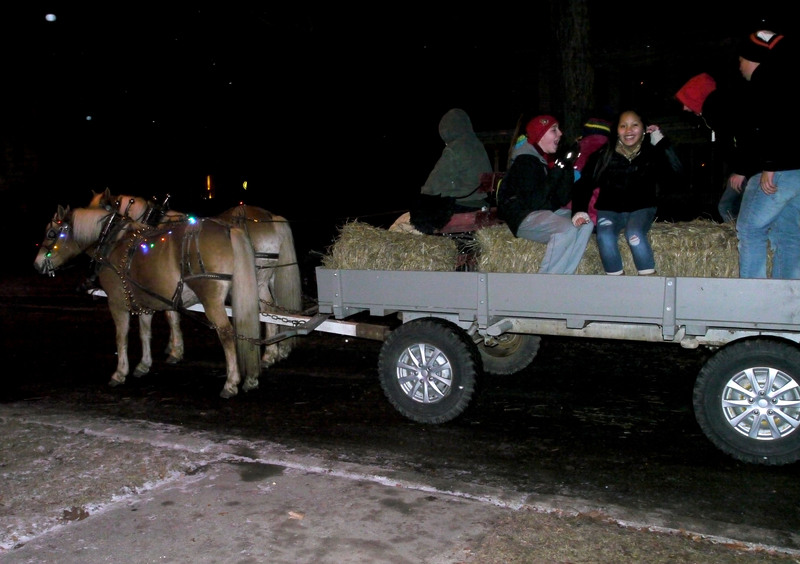 Hundreds of people filled the winter night on their way to or from the holiday celebration underway in Muldoon Park. Quickly, I passed the fire engine parked to serve as an emergency vehicle at the corner of Lincoln and Chemung streets. The crossing guard signaled for me to walk and I headed towards the park. The small village park stood transformed. 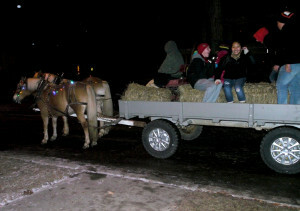 Max Weed and his Halflingers waited by the curb while people climbed into the back of the wagon for a ride. 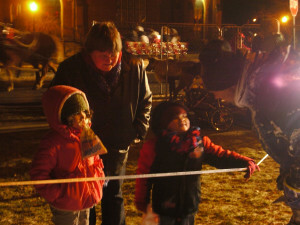 The bandstand decorated with lights glowed as a hum from the crowd filled in the spaces between musical performances. 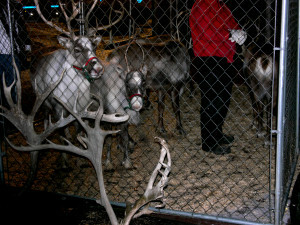 At the corner of Park Avenue and Park Place near the Vietnam War Memorial, Mike Cary and his reindeer stood behind a chain link enclosure. 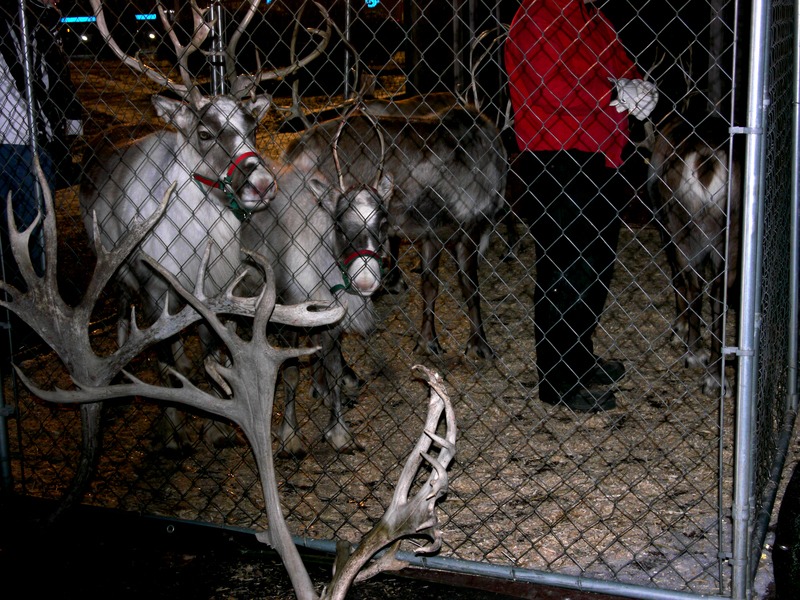 I passed by the reindeer in search of my friend Anne Shaffer. Near the booth that housed Santa, I found her. It wasn’t long before we were joined by the other members of our Zumba group; Fitness with Serena from Athens, PA . Zumba helped me stay in shape, keep extra pounds off and generally have fun. 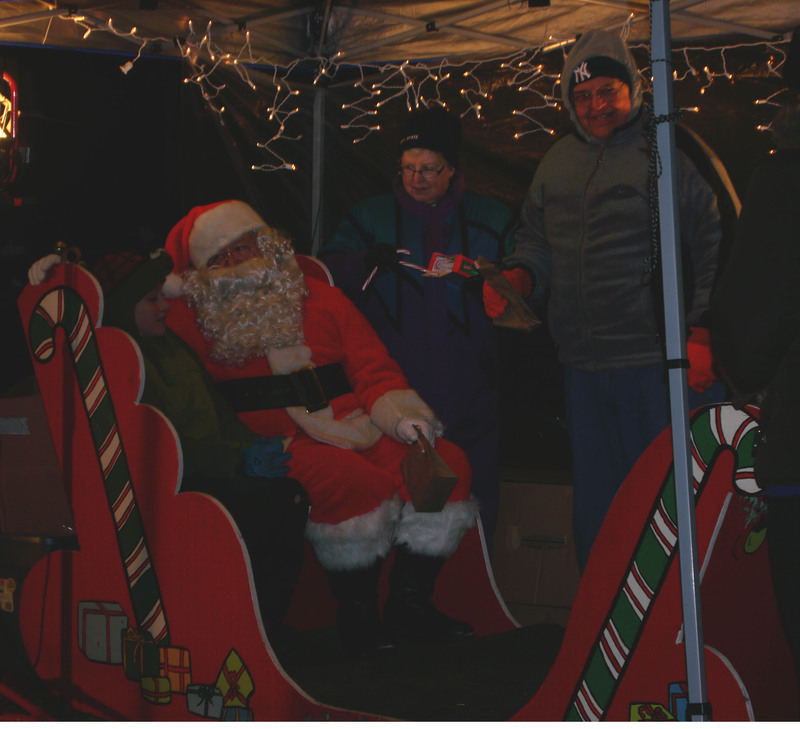 Once the sound equipment was connected, the music motivated my feet and the exercise kept me warm from the biting cold. After we completed our routine, I left the group and met up with my husband, Moe. “Let’s take a look at the ice sculptures,” I said. 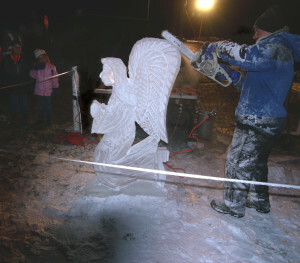 Four sculptors from Sculpted Ice Works carve out their creations in ice at different locations in the park. By walking in a circle through the park, you were able to view each one. Since it was late, the artists were putting the finishing touches on their ice sculptures. 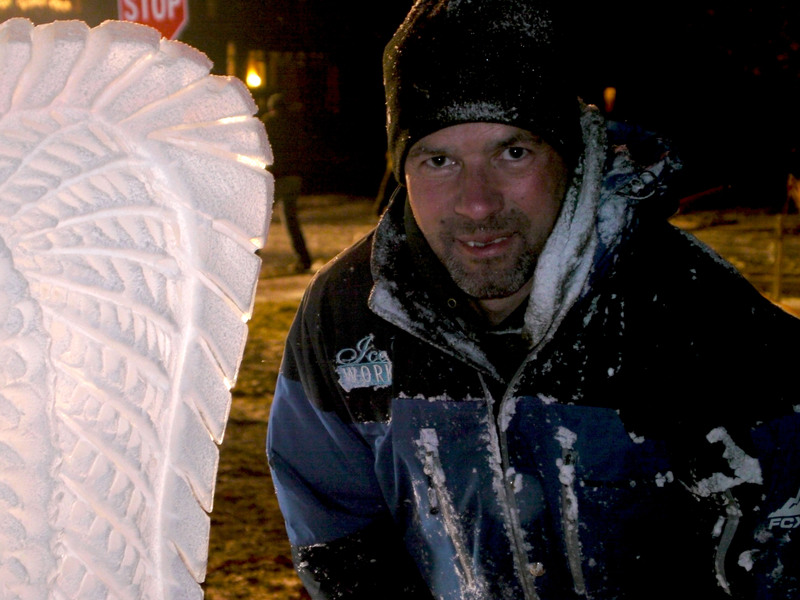 The first ice sculptor we met was John Hanson. He remembered me from last year. 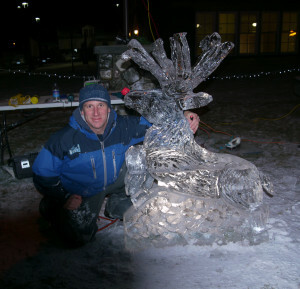 We chatted as he finished up his sculpture of Rudolf by giving him a red nose. “That’s really impressive,” I said. “Thanks, a woman stopped to watch and gave me a tube of lipstick for the nose. It works,” he replied. 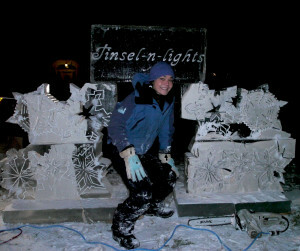 Lora Borer carved her sculpture with a chainsaw carefully cutting out snowflakes and trimming off edges. The words Tinsel-n-lights swirled in gentle curves and clear-cut penmanship in a block of ice balanced on top of the sculpture. She too remembered me from last year and took time to talk with me and others in the crowd. 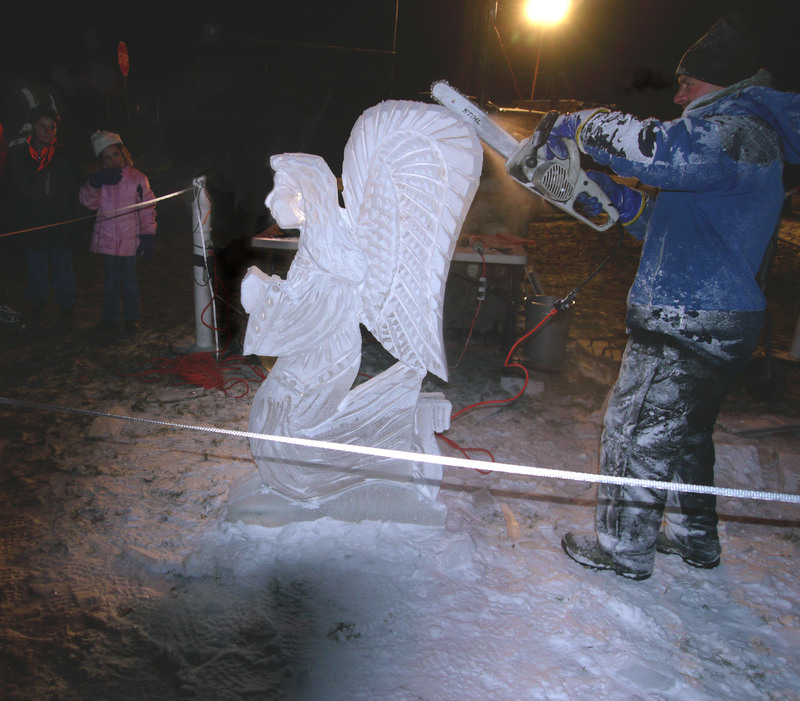 Not far away the buzz of a chainsaw hit the cold air as Neil Trimper neatened and refined his ice-sculpture of a kneeling angel. A crowd gathered to watch and he stopped periodically to answer questions from people observing his work. 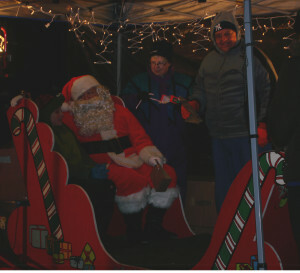 I remembered Neil from my first Tinsel-n-Lights 2011. “So where do you go after your done here?” I asked. Moe and I stopped to view Walter Gasiorek’s sculpture of an elf. This was Walter’s first year at Tinsel-n-lights. Before long, we said our farewells to Walter and called it a night. The temperature proved bitter cold and most of the crowd had left. Lucky for us it was a short walk up Lincoln Street and home. This entry was posted in Uncategorized and tagged ice-sculpture, NY, Tinsel-n-Lights 2013, Waverly, winter holiday celebration. Bookmark the permalink.